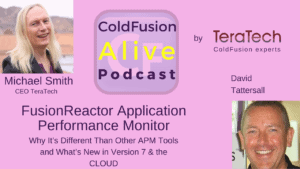 David Tattersall talks about “FusionReactor Application Performance Monitor – Why It’s Different Than Other APM Tools and What’s New in Version 7 & the CLOUD” in this episode of ColdFusion Alive Podcast with host Michaela Light. His flagship product – FusionReactor is used on over 25,000 production servers and has been purchased by over 5,000 customers. How long has FusionReactor been around and who’s using it? 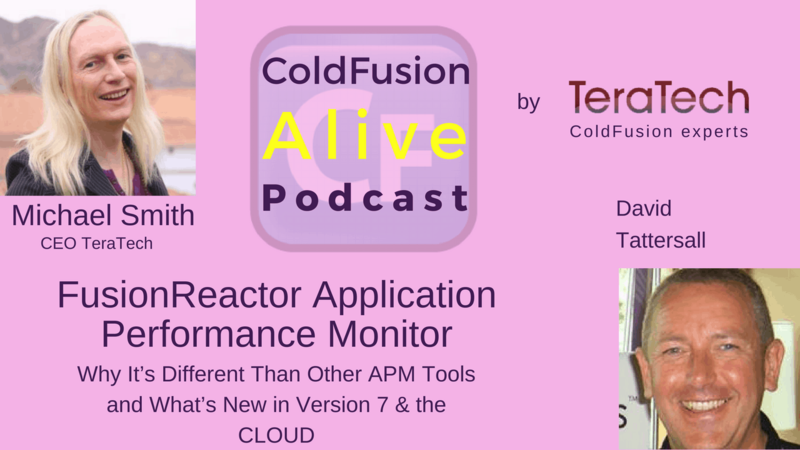 What differentiates FusionReactor from other Java APM tools? What’s the overhead on the server when running FusionReactor? What is exciting in the new version 7? Why did you add FR to the CLOUD? 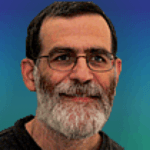 What versions of ACF and Lucee does FR work with? What is in your dev roadmap for the next year? Why do you support CF conferences around the world? Why are you proud to support CF? WWIT for CF to be more alive this year? 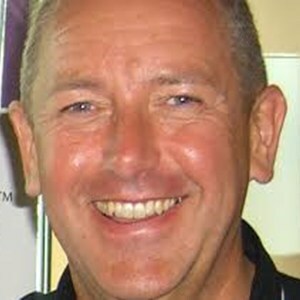 David Tattersall has been in working in IT for over 30 years. Since co-founding Intergral in 1998, he focused on company management, business development and sales & marketing. Intergral has become a leader in server monitoring and application performance monitoring (APM) solutions in the ColdFusion / Java segment. 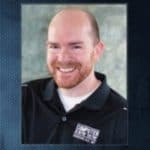 His flagship product – FusionReactor – www.fusion-reactor.com is used on over 25,000 production servers and has been purchased by over 5,000 customers. Michael: Yes. We're going to also look at how FusionReactor works in the cloud and what versions of ColdFusion and Lucee does it work with. And we'll also look at the roadmap for FusionReactor coming up. So lots of exciting stuff. So welcome, David. David : Thank you, Thank you, Michael. Thank you for having me on the show. Michael: You are so welcome. So what exactly is FusionReactor? I'm sure there's at least three people listening who haven't got a clue what FusionReactor is. You want to enlighten them? David : Yeah, so FusionReactor is the global market leader for performance monitoring on the ColdFusion platform. FusionReactor is a low-overhead Java monitor. It gives developers DevOps and operations folks a really deep insight into exactly how their applications are performing and how they execute a production runtime. FusionReactor's a hybrid monitor so it's always on premise. And we've also got a cloud version, so FusionReactor CLOUD, so you can extend it into the cloud. Michael: How long has it been around, David? Michael: So 12 years? It's nearly a teenager. David : Coming onto 12 years, yes. We've got around 5,000 customers that's taken FusionReactor. We've got at least 25-plus thousand servers running FusionReactor in production right now.